Dr. Andrew Mick completed an optometric residency in ocular disease at the Bascom Palmer Eye Institute. He is a Staff Optometrist at the San Francisco VA Medical Center where he is the Director of the optometric residency program. 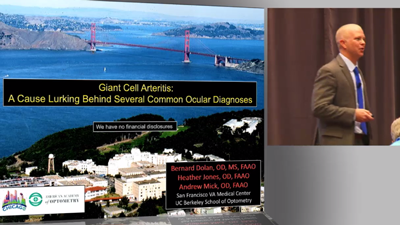 He is an Associate Clinical Professor at the University of California Berkeley School of Optometry and on the faculty of the UCSF Department of Ophthalmology. He currently is the Chair of the Scientific Program Committee of the American Academy Optometry and is on the Editorial Board of their Journal, Optometry and Vision Science. Patients present with a variety of lumps and bumps associated with the ocular and periocular tissues. 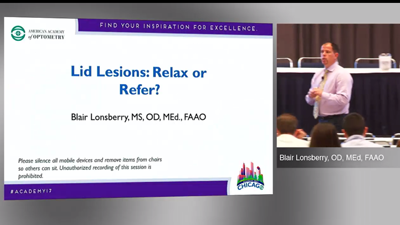 This interactive presentation will review the various periocular lesions focusing on differentiating benign from the malignant, differentials and current treatment/management options including when to refer. Optometry’s ever expanding scope of practice necessitates that optometrists continue to expand their knowledge in a variety of new and exciting clinical areas. 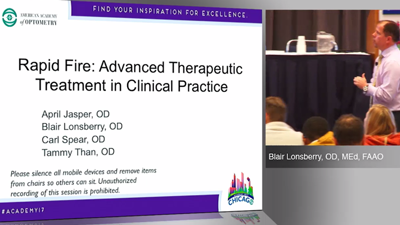 This interactive and rapid-fire presentation explores cutting edge clinical care in advanced therapeutic treatment options including lasers, minor surgical procedures and oral/topical therapeutic agents. 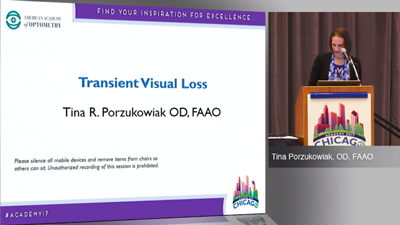 This lecture will survey the utilization of intravenous medications in a hospital-based optometric setting, highlighting the importance of a multi-disciplinary approach to care. Indications, contraindications, and common side effects of various IV medications will be discussed and taught through clinical grand rounds format. Brandon Runyon, OD, FAAO completed his optometry degree at the University of Alabama at Birmingham School of Optometry in 2013. Following graduation, he completed a residency program in Family Practice and Ocular Disease at Northeastern State University Oklahoma College of Optometry in 2014. He has since served as a staff optometrist for Indian Health Service at Chinle Hospital Eye Clinic in Chinle, AZ. He now serves as the optometry residency coordinator and is adjunct clinical faculty for the Southern California College of Optometry at Marshall B. Ketchum University. Infectious retinal diseases are devastating, and can to lead permanent visual field and acuity loss. They can be due to various causes including bacteria, viruses, fungi, and can be in immune competent patients, but also, and at times more frequently, in immune-comprised patients such as those with advanced acquired immune deficiency syndrome (AIDS). Since many of these conditions are potentially blinding, early diagnosis, testing, and treatment are vital. This lecture will focus on select conditions in the retina with a discussion on pathogenesis, signs and symptoms, testing, and treatment. Case examples will also be introduced. Recent advances in optical coherence tomography imaging technology now include angiography which allows for quantification of vascular density and flow within the retina and choroid. These advancements have led an explosion of research regarding the clinical utility of optical coherence tomography angiography (OCT-A) in various retinal diseases. This course will provide a review of this emerging technology including its advantages and limitations as compared to conventional fluorescein angiography. 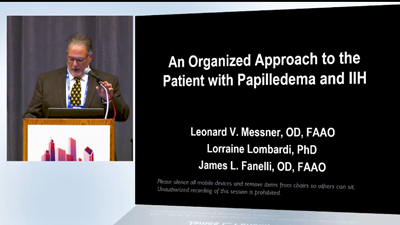 Additionally, the role of OCT-A in the diagnosis and management of a variety of retinal conditions including diabetic retinopathy, retinal occlusive disease, and age-related macular degeneration will be explored. In order to receive distance learning credit for this course, please view it at https://learning.aaopt.org/products/oct-angiography-imaging-motion-credit. Richard Trevino is an Associate Professor at the Rosenberg School of Optometry, where he has taught since 2010. He serves as Director of Residency Programs and Chief of the Ocular Health Service. In 2014, RSO launched a Glaucoma Center of Excellence under the direction of Dr Trevino, funded, in part, by a grant from Capital One, to provide glaucoma care, research and education. The grant enables the clinic to care for indigent patients who otherwise would be unable to afford treatment of their glaucoma. Dr Trevino practiced in the Veterans Administration for 13 years. He is a graduate of the Illinois College of Optometry and completed a residency in Primary Care Optometry at the Pennsylvania College of Optometry. He has held faculty and adjunct appointments at the University of Waterloo, State University of New York, and the New England College of Optometry. Dr. Porzukowiak is an Associate Professor at Midwestern University, Arizona College of Optometry. She earned a Doctorate of Optometry degree from the University of Missouri – St. Louis and completed a post-doctoral residency in ocular disease and low vision rehabilitation at the Jesse Brown VA Medical Center in Chicago, Illinois and the Edward J. Hines, Jr. Central Blind Rehabilitation Center in Hines, Illinois. 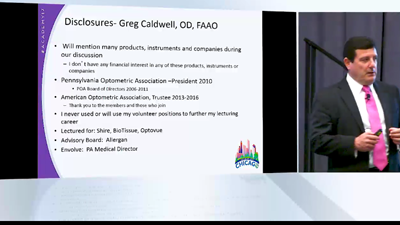 She is a Fellow of the American Academy of Optometry where she serves on the Admittance Committee and as the Program Chair for the Primary Care Section. Her primary area of interest is neuro-ophthalmic disease.